The annual average temperature in Pakistan is expected to go up by five degrees Celsius by the end of the century, according to the data compiled by the Climate Impact Lab. At the beginning of the century, the average annual temperature in Pakistan was 21 degrees Celsius whereas, by the end of the century, it is expected to rise up to 26 degrees Celsius. 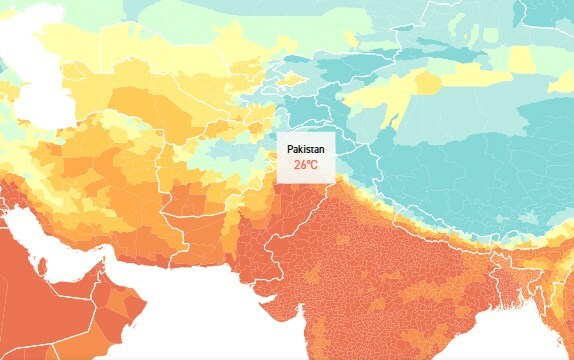 According to the data, Lahore and its neighbouring areas are likely to get hotter even if Pakistan and its neighbours continue to take actions to curb greenhouse emissions in line with the pledges of the Paris Agreement. Mean annual temperature in Pakistan at the beginning of the current century. At the beginning of the century, there were a total of 198 32-degree days in Lahore and its surrounding areas whereas by the end of the century, the number of 32-degree days is expected to range between 229 and 245. This change in temperature will also be felt in other parts of the world. In tropical regions such as Jakarta in Indonesia, where there were five months with an average temperature of 32 degrees Celsius at the beginning of the year 2000, the heat might last there throughout the year. In Indian capital New Delhi, the months with 32-degree days will increase from six to eight months. In Spain’s Madrid, the number of 32-degree days would double or triple by the end of the century. “How different cities and regions experience an increase in 32-degree days depends in part on how well adapted to heat they already are,” said Dr Kelly McCusker, a climate scientist at the Rhodium Group. The data compiled by the Climate Impact Lab does not take into account the factor of humidity which makes the situation worse when the weather is already hot. Humidity severely impacts the lives of people in developing countries where outdoor labourers and factory workers are exposed to severe climatic conditions and are more prone to heatstroke and other health hazards. High temperature also impacts food production and is one of the leading causes of draughts. Other than that, the electricity demand also skyrockets in hot weather.